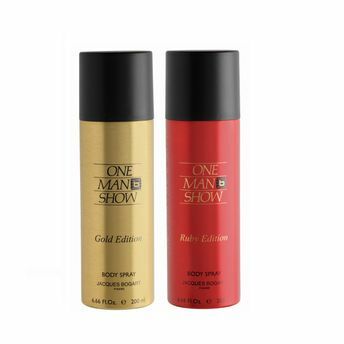 Jacques Bogart One Man Show Gold Deodorant Spray - 200ml: The new limited fragrance attracts attention with its foamy and juicy sweet notes of mandarin and apples, enriched with violet flowers and orange blossom in top notes. A heart encompasses characteristic nuances of aromatic lavender and geranium spiced with cinnamon and cloves providing power and tart note. A base intertwines warm and pleasant woody accords, labdanum, ambergris and musk. Jacques Bogart One Man Show Ruby Deodorant Spray - 200ml: The composition of One Man Show Ruby Edition opens with tart and refreshing notes of orange leaves, aromatic frozen lavender and green apple announcing a warm, mysterious heart full of shades of intense saffron, incense and labdanum. The base is deep and warm, created of oud, red cedar and honey.